Skin graft after fasciotomy. Close-up of a patient's lower leg around six months after surgery for a split-thickness skin graft (STSG) over a fasciotomy site. 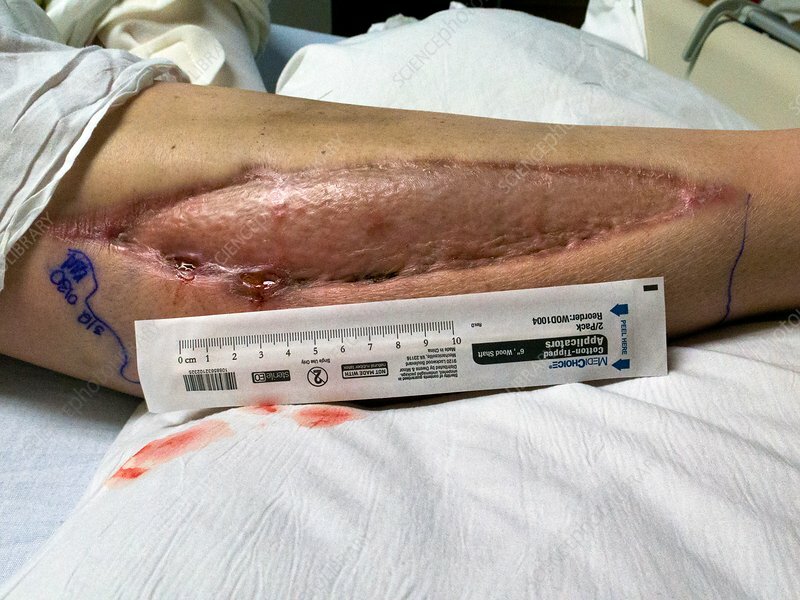 Fasciotomy is the removal of connective tissue around muscles to relieve pressure, in this case from compartment syndrome, a life-threatening condition where injury can cause increased pressure within one of the body's compartments such as an arm or leg. There are pockets of infection (centre left) along the edge of the graft. Next to the graft site is the packaging for a cotton-tipped applicator and a scale bar, showing the size of the graft site.